-- Select a Size/Color -- Duck - Out of Stock! This interactive dog toy has 4 layers of 1680 denier nylon for super durability which makes this a durable, superb toy for shaking, tugging, and general rough housing. This dog toy will keep your dog distracted for hours. Pentapulls are a classic must have dog toy that make a perfect gift for your best friend. 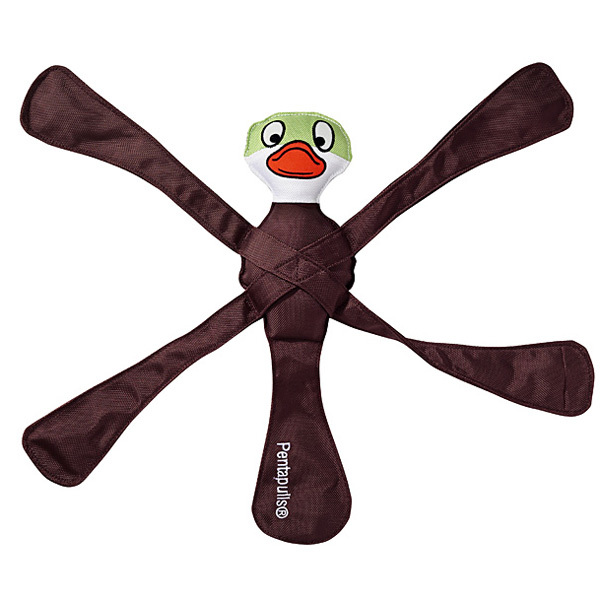 The arms and legs are designed in an "x" and super stitched to form an excellent toy for pulling, shaking and general rough housing. 5 squeakers. Pentapulls Dog Toy - Duck Customer Photos - Send us your photo! Posted On 05/20/17 by Kelli K from Lacey, WA Yes, Kelli K recommends this product! My dog loves his new ducky toy, but unfortunately ducky only lasted about a week before he was squeaker-less and a big pile of string. Granted, my dog is an extreme chewer which is why I am giving this toy 4 stars. He really does love it and had a great time ripping out all the squeakers. I highly recommend if your dog isn't notorious for destroying toys. Posted On 05/13/17 by kim n from Edgewood, KY Yes, kim n recommends this product! I have 3 dogs and they love to play tug a war! This toy is perfect for that and more importantly , very durable! Posted On 11/07/13 by Jennifer D from Modesto, CA Yes, Jennifer D recommends this product! I have ordered previous dog harnesses and was very satisfied with the product.